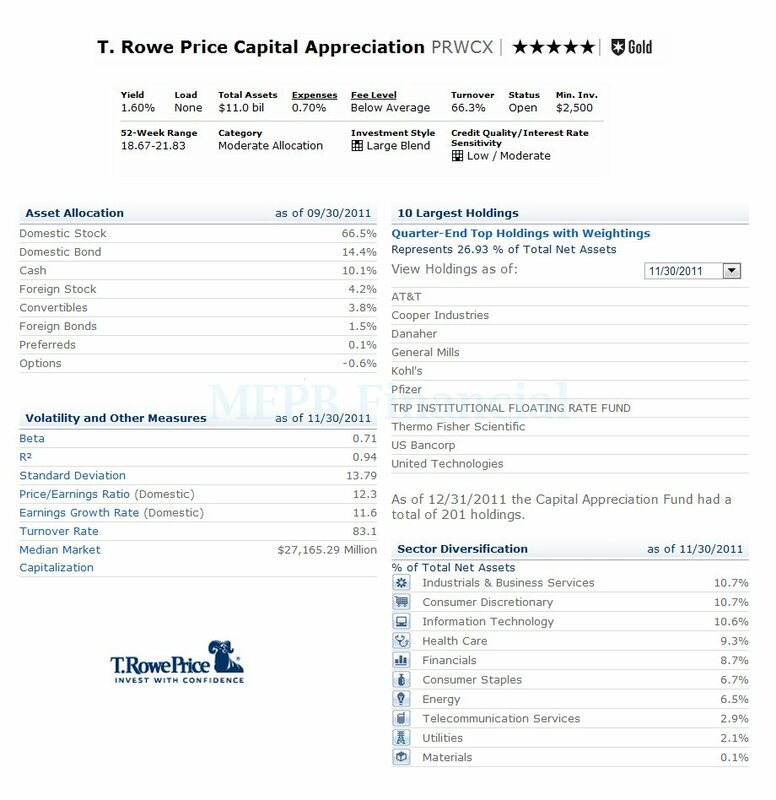 As an asset management company, T Rowe Price Group offers variety of top mutual funds. According to latest count, there are over 90 no load mutual funds and over 45 top rated mutual funds. These funds are rated 4 & 5 star by Morningstar. One of these best rated funds is T. Rowe Price Capital Appreciation (PRWCX) fund. More fund’s review can be found below. 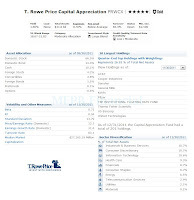 The T. Rowe Price Capital Appreciation fund aims to provide long-term capital appreciation. This balanced fund typically invests in stock and bonds. It invests primarily in the common stocks of established U.S. companies with above-average potential for capital growth. It invests at > ½ of assets in common stocks and the remaining assets in other securities such as convertible securities, corporate and government bonds, foreign securities, futures, and options. Since June 2006, David R. Giroux is the fund’s manager. Giroux is a Vice President of T. Rowe Price Group Inc and T. Rowe Price Associates Inc. As part of no load fund, this fund’s expense ratio fee is 0.70%. This best balanced fund also has a yield of 1.60%. The total net assets of this hybrid fund are $11 Billion. The fund has received 5 star rating from Morningstar. Morningstar also gives Gold Analyst rating. This top rated balanced fund is also featured in the 2011 Money 70 Best Funds list. It also ranked 12 out of 57 fund families surveyed in the annual Lipper/Barron’s Fund Family Survey of 2010. For 2011, this PRWCX fund returned 3.19%. This balanced fund has returned 16.13% over the past 3 years, 3.59% over the past 5 years, and 7.82% over the past decade. Over the past 26 years, this fund has managed to achieve better result than its peer. It has 23 positive return years and 2 negative return years. The best performance occurred in 2009 with 33.05%. Hence, this moderate allocation mutual fund is currently opened to new retail investor; you can buy this top rated fund. For brokerage account, the minimum initial to invest is $2,500. For tax deferred account, you can start with as little as $1,000. This PRWCX fund can be bought from 93 brokerages like: T Rowe Price, Schwab, Matrix Financial Solutions, Hatford CPS, Sun Life Recordkeeper Plus, Nationwide Retirement Flexible Advantage, etc. As of October 2011, the fund’s asset is allocated as follows: 66.5% in Domestic Stock, 14.4% in Domestic Bond, 10.1% in Cash, 4.2% in Foreign Stock, 3.8% in Convertibles, 1.5% in Foreign Bonds, 0.1% in preferreds, and -0.6% in Options. This top fund has 201 holdings. The top 5 sectors diversifications are: Industrials & Business Services (10.7%), Consumer Discretionary (10.7%), Information Technology (10.6%), Health Care (9.3%), and Financials (8.7%). As of December 2011, the fund's top 10 holdings are: AT&T, Cooper Industries, Danaher, General Mills, Kohl's, Pfizer, TRP Institutional Floating Rate Fund, Thermo Fisher Scientific, US Bancorp, and United Technologies. Investing in mutual fund involves risks. According to the fund’s prospectus, the principal investment risks are stock market risk, fixed income risk, interest rate risk, foreign investment risk, management risk, etc.